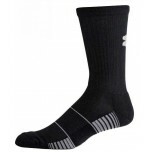 The best basketball referee socks provide you the most muscle support while running up-and-down the court. We recommend over-the-calf socks for that purpose, but you may prefer crew socks in your youth or summer league games. All brands are court-tested, official approved - Under Armour, New Balance, Pro Feet and Force3. All black referee socks are court-tested and are all black to match your shoes and pants. These socks are amazing! Legs and feet feel great all the way through and after the game. No fatigue at all! Recommended with 5 stars! These socks are the best. Whether they are under my shin protectors, or I'm on the bases, these are my go-to socks. They keep my feet cool and comfortable at all times. 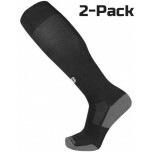 Great socks - great material and long enough to cover for my shin-guards! I have multiple pairs.